A CD Release Event will be held at the Frequency on Friday, December 15th. The band will include Shawndell Marks, Paul Issacs, Annelies Howell and Nathan Russell. DJ Boyfrrriend, Woodrow and Genevieve Hayward will provide support. It’s been more than six years since Anna Wang first appeared on Madison’s music scene; Anna Wang and the Oh Boys released an EP in 2011 entitled Drive Fast. The band was a sharp rock outfit, propelled by drummer Nicky Sund and Jeff Funk (now owner of Funk’s Pub in Fitchburg). The guitars were impressively played by Jeremy Van Mill. The EP got the attention of the local music press and it seemed that Wang was on to something when things took a turn. Wang took a day job on graduating from college in 2012 but a more serious problem was occurring in the Eustachian tubes in her ears. Suddenly unable to rehearse or perform, she became a reclusive workaholic although her songwriting and occasional demo recording continued. All that change not being enough, Wang became disenchanted with the style she’d been pursuing and her direction shifted to electro-pop. Fashioning a home recording facility, Wang began working on material that would eventually end up on In Your Head. In 2016 she and Van Mill decided to take up the challenge and entered Project M, the songwriting and performance contest held each spring by 105.5 Triple M. Billed as the Tortoise and the Finch, the duo never expected to win the competition, a grueling six-week challenge that requires a new composition every week, performed in front of a live audience while being judged and videotaped. No pressure. To both their surprise and delight, they won the contest. That gave Wang some motivation and she’d spent more than a year teaching herself recording and production skills. After Project M she and Van Mill – who plays in his own band Roughneck Grace – took a break. Earlier this year her bad ear improved to some degree and Wang, going through what she has called “her quarter-life crisis,” decided she wanted to devote more time to music. She found a better work-life balance and made the decision to release In Your Head. As a promotional tease, Wang produced a video for “When the Fever Breaks,” a good representation for the songs on In Your Head. Wang is a hopeless romantic. Though her songs reflect her new pop vision, dark undercurrents confirm that these are not merely the shopping mall variety. Though she knows things are bound to implode, the girl can’t help herself. “I wanna take you home to my place / Add your name to my list of mistakes,” she sings over a bed of uncomplicated synth and rhythm tracks. The video for “When the Fever Breaks” was filmed and edited by the notable audio/visual artist Elizabeth Wadium and is a clever travelogue/rewind through a relationship. “Ashes” opens the album in major-key optimism before betraying its sinister prognosis: “We light up our matches / The fire comes in flashes / The damage is tragic / Every kiss is magic / Let it burn to ashes.” “Ashes” builds to an effective climax and then modulates. These are concise, well-written three-minute pop tunes, the whole of the ten-track album playing out in thirty-four minutes. Wang succeeds in inventing soundscapes where the sounds complement each other nicely, the music able to create an uplifting mood even while things crumble emotionally. Close listening reveals deft development and a near-constant introduction of subtle instrumental changes. Wang’s voice is pleasing in timbre and she effectively trades earnestness for understatement. “Rain Down” is a pop torch song, Wang singing seductively and floating up into her head voice while the arrangement sustains the tension. The haunting title track uses pulsating white noise to drive home its point, like a screw turning its way into your mind: “I don’t want your love… / I wanna get in your head… / I just want you to know what you never had.” Vindictiveness comes to the fore in “Break You,” where a percolating, treated piano puts the listener on edge but, just when you fell the anger rushing, Wang introduces cellos. Brilliantly levitating. “Circles” closes the album in a different fashion, built around a finger-picked acoustic guitar, the bridge sounding positively angelic. “Ashes” and “Break You” were recorded at Paradyme with Bill Maynard before Wang moved to her own Blue Room studio. Maynard mastered the completed works at Paradyme. 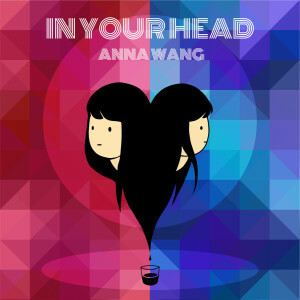 Pop can sometimes melt the magic of musical interaction into cold, mechanical perfection but with “In Your Head” Wang is able to preserve the human touch and in the end makes a boldly emotional and personal statement. It’s good to have her back.